Brooklyn Supper is officially one year old. To celebrate, we had a day of great food. Dinner was the kind of meal you wait all winter for. After so much braising and roasting, it is a great relief to just toss some ingredients on the grill. 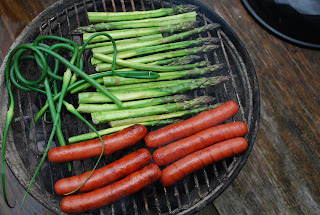 The meal: hot dogs with mustard and sauerkraut; grilled asparagus with lemon zest and garlic scape butter; a couple of grilled garlic scapes; and a big salad with apples and lemony vinaigrette. Yeah, hot dogs. Ever since the whole Dines Farms fiasco we haven’t really bought hot dogs, even though they are one of Brian’s favorite foods. 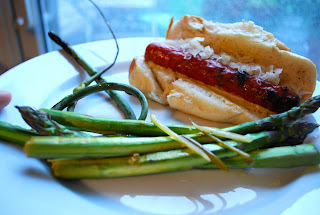 Since grilled hot dogs for dinner was Brian’s sole Father’s Day wish, we had them. And really, they were so, so good. For dessert we had a simple, tangy panna cotta, served over strawberries. Quiet and elegant, this panna cotta was exactly the right thing. This recipe is meant to be made 18-24 hours ahead of time; if you plan to eat the panna cotta the same day it’s made increase the gelatin to 2 3/4 teaspoons and chill for a full four hours. The recipe has a lot of small steps, but it’s really straightforward. If you don’t have ramekins, use any type of small bowl if you want to unmold them, or wine glasses if you don’t. Panna cotta is easily overwhelmed, so consider serving with just a few fresh berries dusted with sugar, and maybe a drizzle of sugar or honey. Avoid anything remotely sour as it will drown the quiet sweetness of the pudding. Panna cotta’s elegance is in the pure simplicity of the cream, and I think it’s best served simply. Pour the milk into a medium sauce pan and carefully sprinkle the gelatin onto the surface of the milk. Set a timer for 10 minutes and leave the gelatin and milk undisturbed. This step gives the gelatin a chance to absorb milk and fluff up without a risk of clumping — do not stir until 10 minutes have passed. While you are waiting, fill a large bowl with a good amount of ice and some cold water. I do this step in the sink. Next, stirring constantly, heat the milk and gelatin over high heat until the mixture reaches 135 degrees. An instant read thermometer accomplishes this best. This will happen quickly — two minutes or less. Turn off the heat and add the sugar and salt, stirring for another two minutes until everything has dissolved. Slowly add the cream and yogurt, stirring constantly and gently. Transfer mixture to a medium bowl and set bowl into the ice bath. This step is designed to chill the mixture as quickly as possible. Stirring occasionally, insert an instant read thermometer and watch for the temperature to come down to 50 degrees. This can take 10-20 minutes. Just check it every so often and give things a gentle stir. In the meantime, set eight ramekins on a large cookie sheet and clear room in the refrigerator. When the mixture has reached 50 dgrees (or close to 50), ladle it into the ramekins, using roughly a half cup per serving, place them on a cookie sheet, cover everything tightly with plastic, and set into the refrigerator. Allow the panna cotta to set for 18-24 hours. If you need it to go longer it will be fine. For easiest plating, gently run a thin but dull knife along sides and flip. There are more complicated ways to unmold the pudding, and, if you’re serving someone very important, look into them, otherwise this method is just fine. Eat immediately as the delicate panna cotta will quickly start to wilt.